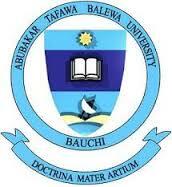 Abubakar Tafewa Balewa University (ATBU) Bauchi Post-UTME and Direct Entry Physical Admission Screening List and Exercise Schedule for Shortlisted Candidates, 2018/2019 Academic Session. This is to inform all UTME and Direct Entry candidates who applied and did online screening for admission into the Abubakar Tafewa Balewa University (ATBU) Bauchi to check their names via the admission portal www.atbu.edu.ng/screening Using your JAMB registration number and appear for physical screening exercise scheduled to take place from 24th September - 30th September, 2018. Comprehensive list of candidates shortlisted will be published on the University Website. Candidates are expected to come along with original copies of their credentials. i.e Online screening slips, physical screening invitation letter, birth certificate or age declaration, downloaded o'level results from the internet at not more than two sittings scratch card pin WAEC, NECO or NABTEB and Grade II or original certificates indigine letters, as well as NCE/ND/IJMB results for Direct Entry candidates and report to their dean of faculties. NOTE: Any candidate who fails to appear for the physical screening exercise on the date stipulated above will be replaced instantly. However change of course will not be entertained after the screning exercise.